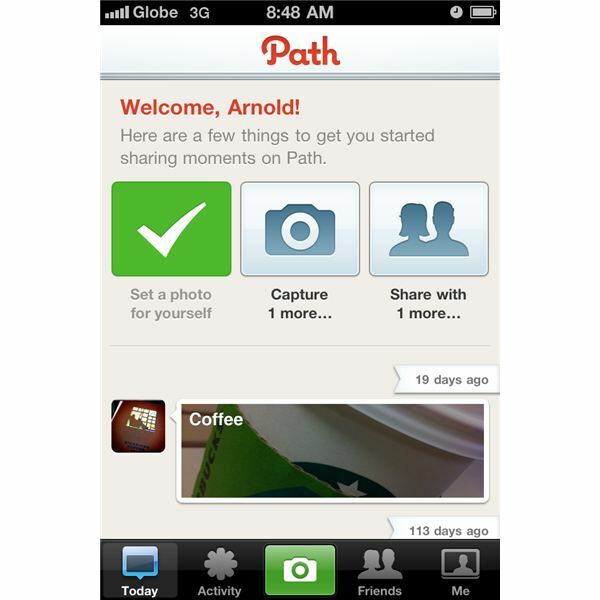 Path iPhone App – What is it? 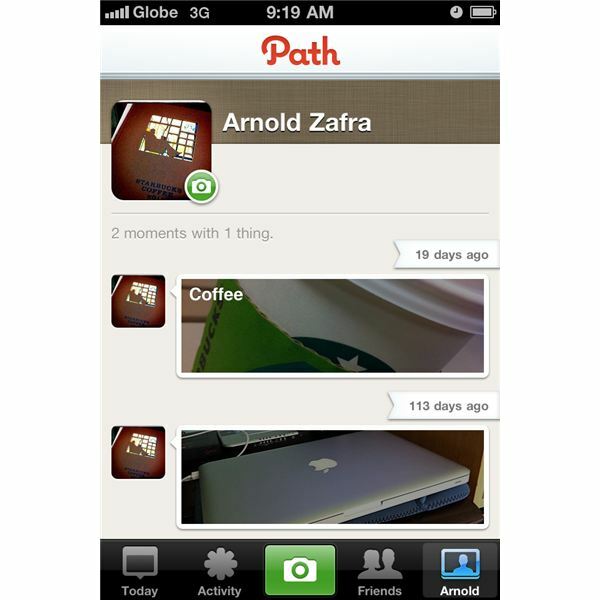 As mentioned, Path is an iPhone app that lets you create a network of your 50 closest friends. You may or may not fill up the 50 friends limit at once to start using the app. You can have 10 to 20 friends and then start sharing photos you've taken using your iPhone. Just like Instagram and other iPhone photo/social networking apps, your photos will be posted on your profile page. And just like Facebook, you can also tag photos to describe whether the photo belongs to People, Places or Things. The main point of Path of course is to share your life's moments or the path that your life takes by taking photos related to those moments. Since this is rather a personal matter, Path allows to limit your friends and family to the 50 most intimate connections. If you value the ability to share your personal information and yet you still want some level of privacy when it comes to sharing your life's path, the Path iPhone app will work for you. The Path strictly adheres to exclusivity of your network of friends and will ensure that your photos and videos will not be viewed by others not within your Path network. 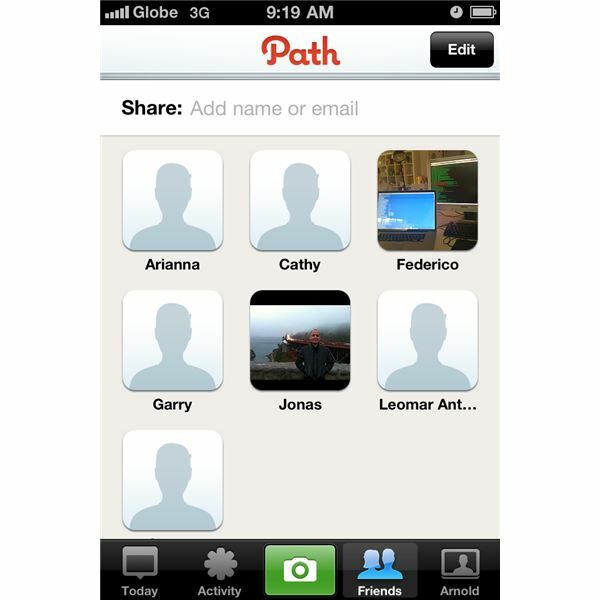 If you're more of the adventurous type and don't mind others not within your network seeing your photos and videos, Path may not work. You'd be better off with other social and photo sharing apps for iPhone. When it comes to functionality, the Path iPhone app does what it says it will do efficiently – that is restrict the people whom you share your life's path with to the connections that you've allowed in to your circle of Path friends. When it comes to interface, the app gives you a pretty simple and yet very functional interface and workflow. The main app's design is not too simple to bore you out of your wits. It has enough colors to keep things interesting. The first time you fire up the Path iPhone app, you'll have 5 options to choose from which you can see from the bottom of the screen. These options include – Today, Activity, Camera, Friends, Your Name or Profile. Those options are pretty much self-explanatory. Choosing Today gives you the thumbnails of photo streams. Activity is simply what your friends have been posting which the app will only display if you have shared your Path with them. Camera opens up your iPhone camera for taking new photos. Friends lists down the people you share your path with and from here you can add new friends by getting their info from your iPhone's contact list or by entering their e-mail addresses. Finally, the last option which is labeled by the name you specify when you create your Path account simply displays your Path profile. Aside from these options, the app also allows you to tag your friends through their Facebook accounts. The app also has the "Lens" feature which allows you to apply some enhancements to your photos before posting them to your Path account. To sum this review up. Path pretty much does what it says it can actually do. It allows you to share your life's moments through photos and videos with people you want to share them with. There is no spillover here like with other social networking apps for the iPhone where friends of your friends can see your profile and view whatever you share. It's definitely a good app to play around with. As compared with Instagram, Path is the less powerful, although the "Lens" feature moves it closer to the Instagram app. The bottom line here is whether you would want to limit the number of people who can view your photos and videos to only 50 people. If you can live with that, then you will surely like Path. Otherwise, well you'll be better off with other social networking/photo sharing iPhone apps.